Regional location of the proposed SpaceX Texas launch facility, from the FAA draft EIS, April 2013. The SpaceX South Texas Launch Site is a spaceport being built at Boca Chica Village near Brownsville, Texas, for the private use of Space Exploration Technologies Corporation (SpaceX). Its purpose is "to provide SpaceX an exclusive launch site that would allow the company to accommodate its launch manifest and meet tight launch windows." The launch site was originally intended to support launches of the Falcon 9 and Falcon Heavy launch vehicles as well as "a variety of reusable suborbital launch vehicles", but SpaceX changed its plans by 2018 and indicated that the site would be used exclusively for BFR. SpaceX CEO Elon Musk indicated in 2014 that he expected "commercial astronauts, private astronauts, to be departing from South Texas," and he foresaw launching spacecraft to Mars from there. During 2012 through mid-2014, SpaceX was considering seven potential locations around the United States for the new commercial launch pad. For much of this period, a parcel of land adjacent to Boca Chica Beach near Brownsville, Texas was the leading candidate location, during an extended period while the US Federal Aviation Administration (FAA) conducted an extensive environmental assessment on the use of the Texas location as a launch site. Also during this period, SpaceX began acquiring land in the area, purchasing approximately 41 acres (17 ha) and leasing 57 acres (23 ha) by July 2014. SpaceX announced in August 2014, that they had selected the location near Brownsville as the location for the new non-governmental launch site, after the final environmental assessment completed and environmental agreements were in place by July 2014. When completed, it will become SpaceX's fourth active launch facility, following three launch locations that are leased from the US government. In April 2013, the best-case estimate was that the first launch might take place in 2016 or 2017, SpaceX conducted a groundbreaking ceremony on the new launch facility in September 2014, and soil preparation began in October 2015. As of March 2018[update], any launches from the site would be no earlier than 2019. Private discussions between SpaceX and various state officials about a future private launch site began at least as early as 2011, and SpaceX CEO Elon Musk mentioned interest in a private launch site for their commercial launches in a speech in September 2011. The company publicly announced in August 2014, that they had decided on Texas as the location for their new non-governmental launch site with construction expected to begin later in 2014. As early as April 2012, at least five potential locations were publicly known, including "sites in Alaska, California, Florida, Texas and Virginia." In September 2012, it became clear that Georgia and Puerto Rico were also interested in pursuing the new SpaceX commercial spaceport facility. The Camden County, Georgia, Joint Development Authority voted unanimously in November 2012 to "explore developing an aero-spaceport facility" at an Atlantic coastal site to support both horizontal and vertical launch operations. The main Puerto Rico site under consideration at the time was land that had formerly been the Roosevelt Roads Naval Station. By September 2012, SpaceX was considering a total of seven potential locations for the new commercial launch pad around the United States. For much of the time since, the leading candidate location for the new facility was a parcel of land adjacent to Boca Chica Beach near Brownsville, Texas. By early 2013, Texas remained the leading candidate for the location of the new SpaceX commercial launch facility, although Florida, Georgia and other locations also remained in the running. Legislation was introduced in the Texas Legislature to enable temporary closings of State beaches during launches, limit liability for noise and some other specific commercial spaceflight risks, as well as considering a package of incentives to encourage SpaceX to locate at the Brownsville, Texas location. 2013 economic estimates showed SpaceX investing approximately US$100 million in the development and construction of the facility, which would "create hundreds of jobs." A US$15 million incentive package was approved by the Texas Legislature. [verification needed] The Texas incentive package had been under consideration since early 2012. From the beginning, one of the proposed locations for the new commercial-mission-only spaceport was south Texas, which was revealed in April 2012 via preliminary regulatory documentation. The FAA's Office of Commercial Space Transportation initiated a Notice of Intent to conduct an Environmental Impact Statement and public hearings on the new launch site, which would be located in Cameron County, Texas. The Texas site would support up to 12 commercial launches per year, including two Falcon Heavy launches. "Before anything could be done on the project, an environmental impact statement, a public scoping period and a public scoping meeting would need to be held." The first public meeting was held in May 2012. Map showing proposed locations of the control center and vertical launch area at the Texas facility, from the FAA draft EIS, April 2013. The FAA released a draft Environmental Impact Statement (EIS) for the location in south Texas in April 2013, and "found that 'no impacts would occur' that would force the Federal Aviation Administration to deny SpaceX a permit for rocket operations near Brownsville." The FAA will not issue a permit until after public hearings are completed and the draft report becomes final, originally expected in late 2013, but was not actually released by the FAA until July 2014. The draft EIS identified three parcels of land—total of 12.4 acres (5.0 ha)—that would notionally be used for the control center. In addition, SpaceX had leased 56.6 acres (22.9 ha) of land adjacent to the terminus of Texas State Highway 4, 20 acres (8.1 ha) of which would be used to develop the vertical launch area; the remainder would remain open space surrounding the launch facility. A public hearing on the draft EIS was held in May 2013, at the International Technology Education and Commerce Center in Brownsville.The public comment period ended in June 2013, and the final EIS had been expected to be released before the end of 2013. In July 2014 the FAA officially issued its Record of Decision concerning the Boca Chica Beach facility, and found that "the proposal by Elon Musk’s Space Exploration Technologies would have no significant impact on the environment," approving the proposal and outlining SpaceX’s proposal. This latest clearance allows SpaceX to apply for licenses from the FAA to launch the Falcon 9 and Falcon Heavy orbital vertical launch rockets, which also could carry the Dragon capsule, and a variety of smaller, reusable sub-orbital launch vehicles from the Boca Chica site." The company formally announced selection of the Texas location in August 2014. In September 2013, the State of Texas General Land Office (GLO) and Cameron County signed an agreement outlining how beach closures would be handled in order to support a future SpaceX launch schedule. The agreement is intended to enable both economic development in Cameron County and protect the public’s right to have access to Texas state beaches. Beach closures would be allowed only on specific dates, and could not exceed a maximum of 15 hours per closure date, with no more than three scheduled space flights between the Saturday prior to Memorial Day and Labor Day, unless GLO approves the launch dates. Prior to a final decision on the location of the spaceport, SpaceX began purchasing a number of real estate properties in Cameron County, Texas beginning in June 2012. By July 2014, SpaceX had purchased approximately 41 acres (17 ha) and leased 57 acres (23 ha) near Boca Chica Village and Boca Chica Beach through a company named Dogleg Park LLC, a reference to the type of trajectory that rockets launched from Boca Chica will be required to follow. Prior to May 2013, five lots in the Spanish Dagger Subdivision in Boca Chica Village, adjacent to Highway 4 which leads to the proposed launch site, had been purchased. In May 2013, SpaceX purchased an additional three parcels, adding another 1 acre (0.40 ha), plus four more lots with a total of 1.9 acres (0.77 ha) in July 2013, making a total of 12 SpaceX-purchased lots. In November 2013, SpaceX substantially "increased its land holdings in the Boca Chica Beach area from 12 lots to 72 undeveloped lots" purchased, which encompass a total of approximately 24 acres (9.7 ha), in addition to the 56.5 acres (22.9 ha) leased from private property owners. An additional few acres were purchased late in 2013, raising the SpaceX total "from 72 undeveloped lots to 80 lots totaling about 26 acres." In late 2013, SpaceX completed a replat of 13 lots totaling 8.3 acres (3.4 ha) into a subdivision that they have named "Mars Crossing." In February 2014, they purchased 28 additional lots that surround the proposed complex at Boca Chica Beach, raising the SpaceX-owned land to approximately 36 acres (15 ha) in addition to the 56-acre lease. SpaceX’s investments in Cameron County continued in March 2014, with the purchase of more tracts of land, bringing the total number of lots it now owns to 90. Public records showed that the total land area that SpaceX then owned through Dogleg Park LLC was roughly 37 acres. This is in addition to 56.5 acres that SpaceX then had under lease. By September 2014, Dogleg Park completed a replat of lots totaling 49.3 acres (20.0 ha) into a second subdivision, this one named "Launch Site Texas", made up of several parcels of property previously purchased. This is the site of the launch site itself while the launch control facility is planned two miles west in the Mars Crossing subdivision. Dogleg Park has also continued purchasing land in Boca Chica, and now owns a total of "87 lots equaling more than 100 acres (40 ha). SpaceX broke ground on the new launch site in September 2014, but indicated that the principal work to build the facility "will not ramp up until the second half of 2015" after the SpaceX launch site development team completes the work to build a second SpaceX pad in Florida, at a leased location: Kennedy Space Center Launch Pad 39A. The same team is expected to manage the work to build the Boca Chica facility. Advance preparation work should commence ahead of that. SpaceX continues to anticipate spending approximately US$100 million over three to four years to build the facility, while the Texas state government expect to spend US$15 million to extend utilities and infrastructure to support the new spaceport. The design phase for the facility was completed by March 2015. In September 2014, the Mars Crossing command center area had been fenced and two portable buildings installed. Vendor events for potential contractors and suppliers were scheduled in February 2015, with priority for limited appointments going to local vendors. In order to stabilize the waterlogged ground at the site, SpaceX engineers determined that a process known as soil surcharging would be required. For this to happen, some 310,000 cubic yards (240,000 m3) of new soil was trucked to the facility between October 2015 and January 2016. In January 2016, following additional soil testing that revealed foundation problems, SpaceX was not planning to complete construction until 2017, and the first launch from Boca Chica was not expected until late 2018. In February 2016, SpaceX President and COO Gwynne Shotwell stated that construction had been delayed by poor soil stability at the site, and that "two years of dirt work" would be required before it can build the launch facility. Construction costs should, as a result, be higher than previously stated. The first phase of the soil stabilization process was completed by May 2016. Progress on building the pad had slowed considerably by late 2017, much slower than either SpaceX or Texas state officials had expected when it was announced in 2014. Support for SpaceX, however, remained fairly strong amongst Texas public officials. In January 2018, Shotwell said the pad might be used for "early vehicle testing...late this year or early next year" but that work would be required after that to make it a launch site. 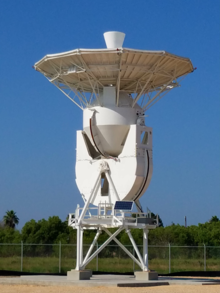 Two 30 ft (9 m) S-band tracking station antennas procured from NASA's Merritt Island Spaceflight Tracking and Data Network station at Kennedy Space Center, were installed at the site in 2016–2017. Formerly used to track the Space Shuttle during launch and landing, these antennas will be used as additional tracking resources for manned Dragon missions. Utility-supplied grid electric power for the new facility will be provided by Magic Valley Electric Coop. "Potable water will be trucked to the facility, which will be served by a septic system." There will also be a SpaceX-owned 6.5-acre (2.6 ha) photovoltaic power station on site to provide off-grid electrical power in the vicinity of the proposed launch control center." Permit was applied for in July 2015; the general contractor for building the generation facility is SolarCity. The solar farm was installed in January 2018. In May 2018, Elon Musk clarified that the South Texas launch site would now be used exclusively for BFR. A 95,000-gallon liquid oxygen tank arrived at the site in July 2018. In February 2019, SpaceX confirmed that the flight-article Starship and Super Heavy vehicles would be manufactured nearby, at the "SpaceX South Texas build site." Vertical launch area of the proposed SpaceX Texas facility, from the FAA draft EIS, April 2013. The new private launch site will be SpaceX's fourth active orbital launch facility, and its first private facility. SpaceX currently leases three US government-owned launch sites: Cape Canaveral Air Force Station Space Launch Complex 40 in Florida, Vandenberg Air Force Base Space Launch Complex 4 in California, and Kennedy Space Center Launch Pad 39A just a few miles north of their existing Florida pad at SLC40 on the adjacent Air Force Station. The launch site is in Cameron County, Texas, approximately 17 miles east of Brownsville with launch flyover range over the Gulf of Mexico. "The latest clearance from the FAA on July 9, 2014, allows SpaceX to apply for licenses from the FAA to launch the Falcon 9 and Falcon Heavy orbital vertical launch rockets, which also could carry the Dragon capsule, and a variety of smaller, reusable sub-orbital launch vehicles from the Boca Chica site. SpaceX proposes up to 12 launches a year through at least 2025, carrying payload to the International Space Station." The launch site will be optimized for commercial activity, and may one day be used to fly spacecraft to Mars. The Texas launch location was projected in the draft EIS to include a 20 acres (8.1 ha) vertical launch area and a 12.2 acres (4.9 ha) area for a launch control center. The launch pad will be directly adjacent to the eastern terminus of Texas State Highway 4. The vertical launch area will include a hangar for horizontal launch vehicle processing—in which the transporter erector will be stored between launches—as well as a launch pad and associated flame duct, water tower, four lightning protection towers, propellant storage and handling areas, associated workshop/warehouse/utility structures, and a "retention basin for deluge water." In the draft EIS preliminary plan, the control center was to be located approximately two miles (3.2 km) west of the vertical launch area, adjacent to Boca Chica Village. It would consist of two launch control center buildings, two payload processing facilities, a launch vehicle processing hangar, communication equipment, electrical generating equipment and diesel fuel storage, as well as a storage facility for small amounts of satellite propellants. SpaceX is also modifying several residential properties in Boca Chica Village, but apparently planning to leave them in residential use, about 2 miles (3.2 km) west of the launch site. Launches on orbital trajectories from Brownsville will have a constrained flight path, due to the Caribbean Islands as well as the large number of Oil platforms in the Gulf of Mexico. SpaceX has stated that they have a good flight path available for the launching of satellites on trajectories toward the commercially valuable geosynchronous orbit. Although SpaceX initial plans for the Boca Chica launch site are to loft robotic spacecraft to geosynchronous orbits, Elon Musk indicated in September 2014 that "the first person to go to another planet could launch from [the Boca Chica launch site]", but did not indicate which launch vehicle might be used for those launches, nor whether the ITS launch vehicle might launch from Texas even on uncrewed flights. The new launch facility was projected in a 2014 study to generate US$85 million of economic activity in the city of Brownsville and eventually generate approximately US$51 million in annual salaries from some 500 jobs projected to be created by 2024. A local economic development board was created for south Texas in 2014—the Cameron County Space Port Development Corporation (CCSPDC)—in order to facilitate the development of the aerospace industry in Cameron County near Brownsville. The first project for the newly established board is the SpaceX project to develop a launch site at Boca Chica Beach. In May 2015, Cameron County transferred ownership of 25 lots in Boca Chica to CCSPDC, which may be used to develop event parking. The Brownsville Economic Development Council (BEDC) is building a space tracking facility in Boca Chica Village on a 2.3-acre (0.93 ha) site adjacent to the SpaceX launch control center. The STARGATE tracking facility is a joint project of the BEDC, SpaceX, and the University of Texas Rio Grande Valley (formerly the University of Texas at Brownsville at the time the agreement was reached). In January 2016, the South Padre Island Convention and Visitors Advisory Board (CVA) recommended that the South Padre Island City Council "proceed with further planning regarding potential SpaceX viewing sites." ^ a b c d e Foust, Jeff (22 September 2014). "SpaceX Breaks Ground on Texas Spaceport". SpaceNews. Retrieved 14 January 2018. Under that development schedule, Musk said, the first launch from the Texas site could take place as soon as late 2016. ^ "Gov. Perry Announces State Incentives Bringing SpaceX Commercial Launch Facility, 300 Jobs to the Brownsville Area". Office of the Governor Rick Perry. governor.state.tx.us. Archived from the original on 29 August 2014. Retrieved 5 August 2014. ^ a b c Rumbaugh, Andrea (11 January 2018). "Aerospace talent in Texas lauded". Houston Chronicle. SpaceX has a rocket engine testing facility in McGregor and is building a launch site in Boca Chica, said Gwynne Shotwell, president and chief operating officer of SpaceX. The latter project, she said, will be ready late this year or early next year for early vehicle testing. SpaceX will then continue working toward making it a launch site. ^ "Capabilities & Services". SpaceX. Retrieved 14 April 2016. ^ Berger, Eric (5 August 2014). "Texas, SpaceX announce spaceport deal near Brownsville". MySanAntonio.com. Retrieved 5 August 2014. ^ Shotwell, Gwynne (17 March 2015). "Statement of Gwynne Shotwell, President & Chief Operating Officer, Space Exploration Technologies Corp. (SpaceX)" (PDF). U.S. House of Representatives, Committee on Armed Services Subcommittee on Strategic Forces. Retrieved 11 January 2016. SpaceX is developing an additional private launch facility in South Texas to support our commercial launch service contracts. ^ a b c d e f g Nield, George C. (April 2014). Draft Environmental Impact Statement: SpaceX Texas Launch Site (PDF) (Report). 1. Federal Aviation Administration, Office of Commercial Space Transportation. Archived from the original on 7 December 2013. ^ a b Gleeson, James; Musk, Elon; et al. (10 May 2018). "Block 5 Phone Presser". GitHubGist. Our South Texas launch site will be dedicated to BFR, because we get enough capacity with two launch complexes at Cape Canaveral and one at Vandenberg to handle all of the Falcon 9 and Falcon Heavy missions. ^ a b Clark, Steve (27 September 2014). "SpaceX chief: Commercial launch sites necessary step to Mars". Brownsville Herald. Retrieved 30 September 2014. ^ a b c Berger, Eric (4 August 2014). "Texas, SpaceX announce spaceport deal near Brownsville". Houston Chronicle. Retrieved 4 August 2014. ^ "Elon Musk's Futuristic Spaceport Is Coming to Texas". Bloomberg Businessweek. 16 July 2014. Retrieved 11 July 2014. ^ Klotz, Irene (11 July 2014). "FAA Ruling Clears Path for SpaceX Launch site in Texas". Space News. Retrieved 16 July 2014. ^ a b Perez-Treviño, Emma (29 July 2014). "SpaceX, BEDC request building permits". Brownsville Herald. Retrieved 30 July 2014. ^ a b c Foust, Jeff (1 April 2013). "The great state space race". The Space Review. Retrieved 3 April 2013. In the best-case scenario, he said, SpaceX would start construction of the spaceport next year, and the first launches from the new facility would take place in two to three years. ^ a b "SpaceX breaks ground at Boca Chica beach". Brownsville Herald. 22 September 2014. ^ a b Perez-Treviño, Emma (22 October 2015). "Soil headed to Boca Chica for SpaceX". Valley Morning Star. Retrieved 24 October 2015. ^ a b "Foundation Problems Delay SpaceX Launch". KRGV.com/5news. Rio Grande Valley, Texas. 18 January 2016. Retrieved 14 January 2018. SpaceX’s first launch was set for 2017. The company said the launch site won’t be complete until 2017. They anticipate their first launch in 2018. ^ "Texas tries to woo SpaceX on launches". Daily News. 12 February 2014. Retrieved 14 February 2014. ^ Mark Hamrick, Elon Musk (29 September 2011). National Press Club: The Future of Human Spaceflight. NPC video repository (video). National Press Club. Event occurs at 32:30. ^ Dean, James (3 April 2013). "Proposed Shiloh launch complex at KSC debated in Volusia". Florida Today. Retrieved 6 April 2013. ^ a b "Details Emerge on SpaceX's Proposed Texas Launch Site". Space News. 16 April 2012. p. 24. SpaceX is considering multiple potential locations around the country for a new commercial launch pad. ... The Brownsville area is one of the possibilities. ^ Dickson, Terry (16 November 2012). "Camden County wants to open Georgia's first spaceport". The Florida Times-Union. Retrieved 11 November 2017. ^ "Draft Environmental Impact Statement: SpaceX Texas Launch Site" (PDF). 1. Federal Aviation Administration. April 2013: 87. HQ-0092-K2. Archived from the original (PDF) on 7 December 2013. ^ a b Nelson, Aaron M. (5 May 2013). "Brownsville leading SpaceX sweepstakes?". MySanAntonio.com. Retrieved 6 May 2013. ^ a b Perez-Treviño, Emma (15 August 2013). "SpaceX buys more land". Valley Morning Star. Retrieved 17 August 2013. ^ a b Berger, Eric (25 May 2012). "Texas reaches out to land spaceport deal with SpaceX". Houston Chronicle. Retrieved 27 May 2012. ^ a b c Martinez, Laura B. (15 April 2013). "FAA shares SpaceX EIS report". The Brownsville Herald. Retrieved 17 April 2013. An ongoing environmental review so far has found that 'no impacts would occur' that would force the Federal Aviation Administration to deny SpaceX a permit for rocket operations near Brownsville. ^ a b c Perez-Treviño, Emma (20 June 2013). "SpaceX buys more land here". Valley Morning Star. Retrieved 25 June 2013. ^ a b Perez-Treviño, Emma (23 November 2013). "SpaceX buys more land in Cameron County". Valley Morning Star. Retrieved 27 November 2013. ^ a b Martinez, Laura B. (19 September 2013). "SpaceX beach closure rules set". Brownsville Herald. Retrieved 26 September 2013. ^ a b c Perez-Treviño, Emma (9 July 2014). "FAA approves SpaceX application to launch rockets from Cameron County beach". The Monitor. Retrieved 16 July 2014. ^ Perez-Treviño, Emma (24 May 2014). "SpaceX buys land". Valley Morning Star. Retrieved 16 July 2014. ^ Perez-Treviño, Emma (19 August 2013). "Cameron County closes two streets for SpaceX". Brownsville Herald. Retrieved 17 October 2017. ^ Perez-Treviño, Emma (6 January 2014). "SpaceX buys more Cameron County land". Brownsville Herald. Retrieved 7 January 2014. ^ a b Perez-Treviño, Emma (19 February 2014). "SpaceX continues local land purchases". Valley Morning Star. Retrieved 21 February 2014. ^ a b c d e Perez-Treviño, Emma (25 September 2014). "SpaceX makes more moves". Valley Morning Star. Retrieved 27 September 2014. ^ Perez-Treviño, Emma (14 March 2015). "SpaceX prepping for construction". Valley Morning Star. Retrieved 16 March 2015. ^ Clark, Steve (4 February 2015). "SpaceX vendor fairs slated". The Monitor. Retrieved 4 February 2015. ^ a b Huertas, Tiffany (11 February 2016). "SpaceX working to stabilize land at rocket launch site". CBS4 ValleyCentral.com. Retrieved 13 February 2016. ^ Clark, Stephen (6 September 2016). "SpaceX may turn to other launch pads when rocket flights resume". Spaceflight Now. Retrieved 8 September 2016. ^ Foust, Jeff (4 February 2014). "SpaceX seeks to accelerate Falcon 9 production and launch rates this year". SpaceNews. Retrieved 6 February 2016. ^ Huertas, Tiffany (18 May 2016). "SpaceX construction causing problems for surrounding residents". ValleyCentral.com / KGBT-TV. ^ a b [www.wsbtv.com], accessed 4 January 2018. ^ Pearlman, Robert Z. (2 August 2011). "NASA Closes Historic Antenna Station That Tracked Every Space Shuttle Launch". Space.com News. Retrieved 19 January 2018. ^ Clark, Steve (13 August 2016). "SpaceX moving two giant antennas to Boca Chica". Brownsville Herald. ^ Perez-Treviño, Emma (6 August 2015). "Solar project planned for SpaceX". Valley Morning Star. Retrieved 1 September 2015. ^ Swanner, Nate (7 August 2014). "SpaceX launch facility goes green, will have solar panel field". Slash Gear. Retrieved 18 March 2015. ^ Clark, Steve (11 July 2018). "Boca Chica launch site gets huge rocket propellant container". The Brownsville Herald. ^ Ralph, Eric (16 Feb 2019). "SpaceX job posts confirm Starship's Super Heavy booster will be built in Texas". Teslarati. Retrieved 2019-02-17. fabricators will work to build the primary airframe of the Starship and Super Heavy vehicles at the SpaceX South Texas build site. [They] will work with an elite team of other fabricators and technicians to rapidly build the tank (cylindrical structure), tank bulkheads, and other large associated structures for the flight article design of both vehicles. ^ "The New Residents: Renovation planned for house linked to SpaceX". Valley Morning Star. 29 August 2014. Retrieved 30 August 2014. ^ Gwynne Shotwell (21 March 2014). Broadcast 2212: Special Edition, interview with Gwynne Shotwell (audio file). The Space Show. Event occurs at 03:00–0405:. 2212. Archived from the original (mp3) on 22 March 2014. Retrieved 22 March 2014. we are threading the needle a bit, both with the islands as well as the oil rigs, but it is still a good flight path to get commercial satellites to GEO. ^ Solomon, Dan (23 September 2014). "SpaceX Plans To Send People From Brownsville To Mars In Order To Save Mankind". TexasMonthly. Retrieved 24 September 2014. ^ Jervis, Rick (6 October 2014). "Texas border town to become next Cape Canaveral". USA Today. Retrieved 17 November 2014. ^ Long, Gary (30 July 2014). "Board meets regarding SpaceX project". Brownsville Herald. Retrieved 31 July 2014. ^ Perez-Treviño, Emma (10 May 2015). "Expanding the future". Valley Morning Star. Retrieved 14 May 2015. ^ Kunkle, Abbey (15 January 2016). "City moves forward with viewing facility". Port Isabel-South Padre Press. Retrieved 25 January 2016. Wikimedia Commons has media related to SpaceX (Brownsville, Texas).